Space is the one thing that the majority of people feel is missing in their homes, but fear not! The illusion of space can easily be created in your home by following some of our suggestions, so although you won’t physically have more room, it will certainly feel like you do. Firstly, the colour scheme that you choose to use can have a massive impact on how big or small a space feels. Lighter colours are perfect for creating the suggestion of space as they reflect both natural and artificial light around the room. By using varying shades of the same colours for your flooring, wall coverings and ceilings you’re already off to a great start! Avoid darker colours which can make a room feel smaller and enclosed – this goes for your furniture too. Next you need to make sure that you de-clutter your problem space. 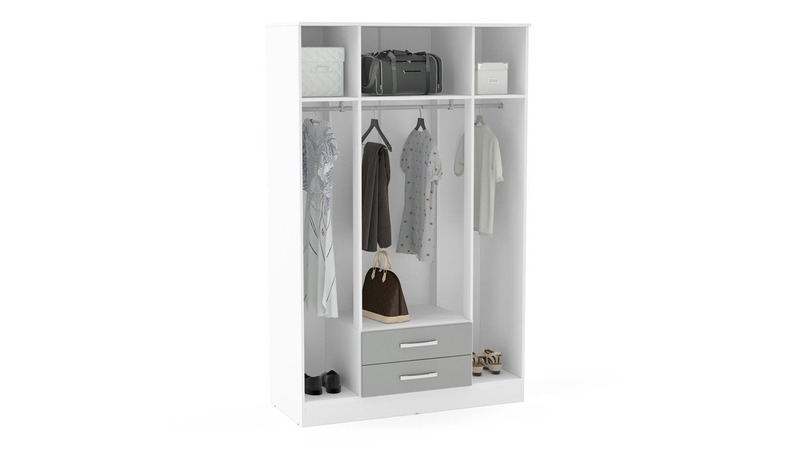 Why not try having one large wardrobe, like our Lynx 4 Door 2 Drawer Wardrobe instead of several chests and wardrobes combined? The more hidden storage you have available in one place, the less clutter you have on display in the bedroom. Also, by having larger statement pieces of furniture in the room as opposed to numerous smaller ones, the space you have will instantly feel bigger because fewer items of furniture gives the impression of a well-organised, spacious room. When choosing the bedroom furniture for your smaller space, make sure you go for furniture in light colours rather than dark colours and woods. White, cream, grey or oak are all great colour options you can try. The lighter coloured bedroom furniture will also help reflect more light especially if it has a built in mirror to bounce the light even more! For added storage space in your bedroom, why not try a 4’ ottoman bed frame? Slightly smaller than a standard double bed, this frame size is still big enough for two and doubles up as a handy hidden storage area! Or if you have a long, thin space to work with, why not try one of our daybed frames which all have a compatible trundle bed available for the extra sleeping space you need at night. Take a look at our Pinterest board for more ideas!